A wedding reception at the Regina Hotel in the mid-1950s. The author, still a boy, is in the front row, far left. His parents are in the third row, also on far left. In the past, weddings were just weddings. Nowadays, they are a big business, involving wedding fairs, wedding planners and hen parties on chartered cruises. At the Weddings Fair, “dazzling stands” promote and sell “wedding dresses, accessories, catering, fairy tale honeymoons, flowers, music, singers, luxury cars, after parties and more”. Competition among wedding planners is fierce. One of them promises that they can get you “hitched within a month”. Before you get “hitched”, you can book your hen “do” at the Hard Rock Café. It won’t be long before someone comes up with the idea of combining the hen-do and the stag party at the same Hard Rock Café. Wedding venues consist of five-star hotels, “prestige” locations, and Malta’s heritage sites. A leading hotel, with its “team of award-winning chefs and expert planners”, promises married couples “a marriage made in Heaven”. These high expectations are in stark contrast to the modest weddings, with no extras that were held at old hotels in Malta in the 1950s, such as at the Imperial Hotel, the Regina Hotel and the Savoy (all of them located in Sliema). Guests were quite satisfied with these weddings - apart from occasional mishaps when the food ran out. 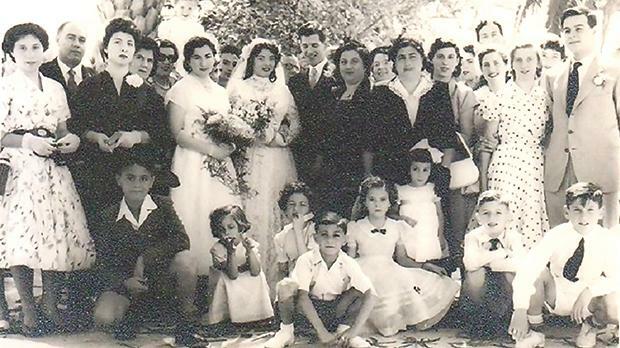 In the late 1940s and early 1950s, I attended with my parents wedding receptions at the claustrophobic premises of Ħamrun commercial garages, which were converted for the occasion into “wedding halls”. The guests at these working-class wedding receptions were seated against the walls as they waited patiently for the waiter to come up to them with trays of ice cream, wedding cake, sandwiches or biskuttini, of which they could partake only one treat at a time. Wedding receptions nowadays are remarkable for their extravagance. At one of these, as reported in Bliss magazine, guests feasted on “an extensive selection of food, including different types of cuisines, from no less than seven food stations”. At another reception, they had “a bit of everything: an Asian table, a sushi table and an Argentinian station”. The highlight at the receptions that were held in the past at Ħamrun commercial garages was the ballroom dancing on the “dance floor”. Even as a boy, I used to get a kick watching macho male guests showing off their dancing skills as they embraced their female partners and “dragged” them all over the dance-floor while they danced the foxtrot or the tango. In the 1950s, the wedding routine was as follows: wedding in a church; a trip to a professional photographer’s studio for a formal wedding portrait; and then the reception. The leading photographer’s studios for weddings were located at Ħamrun. During the wedding season, they did good business. On Saturday and Sunday nights, you would see shiny wedding cars parked in front of their studios. In the 1950s and 1960s, young married couples were considered privileged indeed if they could go on a tour of Rome, Paris and London on their honeymoon. In the 1990s, trendy couples looked further afield for their honeymoon, in places like Miami, Peru or Bali. For the current generation of honeymooners, these places are not “exotic” enough. They travel to Cambodia, Laos and Vietnam or to New Zealand and French Polynesia. Nowadays, everything associated with marriage has to be over the top, including marriage proposals at the top of the Empire State Building. After a lavish wedding reception, today’s weddings have to end on a spectacular note, such as with a fireworks display or with gun salutes. For some couples, a five-star wedding venue in Malta will not do. One young couple married at an Italian castle (just like in a fairy tale), where the bridegroom arrived for the wedding in his “gold coach” - an orange Porsche. Their wedding was a three-day extravaganza, which ended with “dancing the night away until 4.30am”, followed by a late-night swim in the lake. Whether modern-day couples who have “fairy tale” weddings live happily ever after is another matter, which I leave to marriage counsellors to write about.